A vignette of my time with my grandparents | Infinite Space. InfiniteTime. Relieved from the daily grind and the rigors of raising children, my grandparents, Sidney and Augusta Wollman, were the sweetness of my early years. I was the silver star in Papa’s eyes, the natural position of his sole grandson. It was a pie job—effortless basking in unconditional love. We used to sing a little song on the porch in the moonlight. “I see the moon and the moon sees me…” It went like that in a soft little melody with simple words. I haven’t heard it since. Several years later at the Friday evening service of my bar mitzvah, he placed his hands on my head, looked me squarely in the eyes, and whispered for what seemed like an eternity as I, and a temple packed full of people, watched and waited. The only item I recall is this: “Remember, first be an American, then be a Jew.” Telling words they were, straight from the heart of a lightly educated little Polish immigrant who made his way in the world through hard work and ingenuity. They spent half the year in half an apartment in the building Papa built in 1939, in Raleigh, N. C. The bathroom had once been a closet, and there was just enough room in it to turn around to use the three fixtures. I think they loved each other a lot, and I loved it when they were there. We lived in a larger apartment nearby, so it was an easy little-boy-run to their world. They followed the seasons and went south before winter, like the birds in the endless blue canopy. Unlike the birds, they flew in magical white Lincolns. For many years, as the luminous spring blossoms gave way to the summer’s heat, they made the trip back to North Carolina. When that car appeared I’d start running with a light heart that became more buoyant as we drew closer. Seated so comfortably in that classic white sedan with sunny Florida plates, they were an elegant, heartwarming sight, the most beautiful older people I have ever seen. They always brought love and sweetness, chocolate-covered coconut patties, and, somehow, the warmth of the sun itself. Nana waved excitedly, and her smile shone as brightly as her silver hair. Papa looked calm and in control though his bald head barely topped the wheel. I imagined Florida was filled with people just like them—people who’d finally extricated themselves from the grinding, abrasive machinery of daily life for sweeter pursuits wrapped in a more carefree, luxurious concept of time. On occasion we’d ride in the Lincoln when Papa treated us to supper. With cigar in hand, he drove slowly and easily, sometimes right down the middle of the road, singing to himself in the slight Polish accent he never lost. He was always satisfied and relaxed, so at ease while he drove. Nana was the opposite: a nervous driver who held her gaze straight ahead and shuffled the wheel tentatively through her hands. 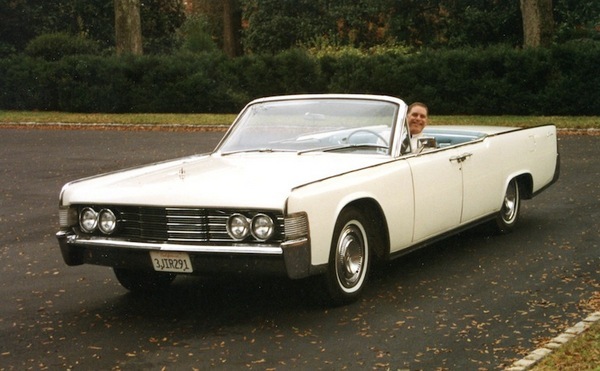 The car was very wide, so wide that I once ran into a telephone pole with a model Lincoln I was “driving” out the window by hand while Nana drove the real thing. I think she got a little too close to the curb. I visited them in Miami Beach several times, at least once all by myself. For a while they lived in a small building on West Bay Harbor Drive right on the water. With Papa beside me I excitedly reeled in my first fish, a yellowtail, which I think we cooked and ate. I distinctly remember the TV, hidden in a recess behind double doors rather high on the wall. Though the man came regularly to fix it, the TV was a big hit with Papa. He was an accomplished channel surfer long before the great proliferation of remote controls. One night I swore I saw the colors in the NBC peacock but Nana reminded me it was a black & white set. Every morning at breakfast, Nana gave us freshly squeezed orange juice, the requisite prune juice for Papa, and cereal with skim milk, my first and last encounter with milk that really isn’t milk at all. Though her cooking skills and the portions were somewhat limited (my mother always said Papa perished from simple starvation), her grace brought joy and contentment to the table. The seltzer man regularly left one of those funny blue bottles with the push button on top, and at my frequent urging we sometimes had supper at the irresistibly named Rascal House. After some time they moved into a high rise building in the great concrete jungle on Collins Avenue. The lobby had a tropical elegance and crystal chandeliers adorned the elevator cars, but the long halls were foreboding and lifeless, with numerous doors that never opened, and a silence which forbade speech. Nana kept her living room furniture hidden under white sheets. Fortunately, Nana’s sisters Tessie, Mae, and Rae lived nearby in similar buildings, so it was easy for them to get together. They never engaged in lengthy intellectual conversation; they just sweetly pounced on each other to get their points across. No one listened very well, but only Rae had a good excuse: a hearing aid in each ear. I thought they were fascinating but mostly they stayed put. She took one out once, held it protectively in her hand while I got lost in its compact, plastic mystery, put it right back in, and that was that. Time took its toll on them. Papa died as I finished high school, Tessie became terminally argumentative, Mae forgot everybody, and finally Rae moved in with Nana, serving as navigator on the starboard side of the Lincoln when they cruised Miami Beach. One day Rae failed to warn Nana about a bus but she found it anyway with the right side of the Lincoln. Though the great ship protected them royally, the time had come for my father to fetch the car. Much to my current chagrin, he sold it to an older man in Raleigh who always wanted one. Lincolns haven’t been quite the same since, but they will motor silently and forever on the tropical coast of my mind, where life is sweet and easy and the sun always remembers to rise. I have only one minor complaint—Nana never bought me the Dymo label maker I saw in the checkout rack at the market. Come to think of it, they never bought me much. Now I know why. God, I’d love to have them back. Thanks to my great friend and accomplished lensman, Ian FG Dunn, for scanning the photos. Ian’s work reflects his agile mind and subtle eye. This entry was posted in Automobilia, Family and tagged cars, transportation. Bookmark the permalink. As change comes ever more quickly, connections to the past are treasures. Pingback: The Trouble with Wisdom | Infinite Space. InfiniteTime.